So, you’re in the market for a pop up changing tent and want to know which option is best for you? You’ve come to the right place! Whether it’s for camping, beach trips, dance competitions or any other activity it doesn’t matter. You deserve a privacy tent from a brand that you can trust. Likewise, it needs to offer the space and functional features to serve your needs. Last but not least, your pop up changing tent should provide fantastic value for money. Do you need a floor? Not all the changing tents reviewed below include a piece of floor material. Of the ones that do it’s optional whether you use it or not. 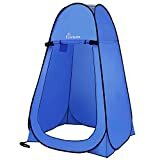 For instance if you’ll primarily be using it as a pop up potty tent outdoors then chances are you won’t want to use the floor. Grass or earth will be fine, after all who wants to continually clean the floor if a bunch of men are using the facility and missing the target! It happens. Getting the size right for it’s intended use is paramount. It might need to be tall enough for 6 footers to take a shower. Wide enough for dancers to change outfits. For potty tent use the width will need to be at the bottom, providing enough elbow room. The whole point of a changing tent is to provide privacy. The material employed on some cheaper offerings is very thin. In daylight this can be semi-transparent. Look out for options with thicker more opaque materials. Some may even have a lining to provide further privacy. Particularly useful when children might be using the facility. Here are five of the most popular pop up changing tents currently on the market, along with our honest and unbiased views on those products. The GigaTent pop up bod is suitable for most users, even if taller people will need to duck down. Despite a roomy inside, it collapses into a portable bag and is very light, making it a good option for a host of activities. Given it’s low price, it can be considered a product for short-term usage, although careful users can get repeated use from it. The pop up changing room doesn’t have a floor, making it versatile. It needs to be staked used the pegs included, but will offer a quick and easy solution to privacy problems in many situations. Zips can be difficult to see and use, but most people can overcome this problem. This is a cheap and cheerful option, especially for kids. For dancers, martial artists, and beach goers, this serves its purpose. Despite claiming to be 6ft tall, anyone above about 5’10” will need to duck. Still, it’s more comfortable than changing in public. 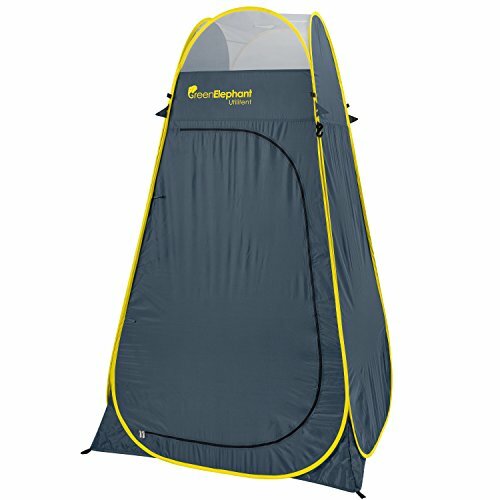 When used properly, the pop up shower tent will offer a sturdy and efficient option for your next adventure. However, the material may perish quite soon due partly to the lack of flooring, although that does add versatility to what it can be used for. If you’re planning to use a pop up changing tent frequently, there may be better options out there. For those only expecting a handful of uses, though, it is a great little product. The sizeable WolfWise shower tent is a versatile option. It can be utilized to enhance a host of outdoor adventures. For example the flap for a portable shower tube is built with easy showering in mind. Its easy installation with poles allows you to use the tent within seconds. Meanwhile, the floor is spacious thanks to dimensions of 47.5” in both directions. This, combined with the height, makes it suitable for most adults to use as well as kids. This WolfWise product offers great privacy, especially compared to lighter blue alternatives which are almost transparent. Due to its lightweight nature, the tent will need to be staked or else it will fly away. Thankfully, this job is almost as simple as packing the product away. 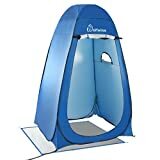 Given the size, this pop up shower tent could be used for various outdoor activities. However, the design certainly lends itself to showering and porta-potty duties as the priorities. With regards to those tasks, the WolfWise item does what it promises to do fairly well. Although there are slightly better products out there. If you simply seek a little privacy and comfort while showering, this is a very good option. The ventilation facilities via the roof and window mean that it won’t smell either. This is particularly crucial for those looking to use the item several times. Just remember that packing it away can take a lot longer than setting it up, and you won’t go far wrong. The premium version of the WolfWise instant shower tent promises to offer users optimum comfort, and it duly delivers. It’s not just bigger than standard options, it’s better too. Simple upgrades like darker materials and three-way zip systems may seem minor upgrades. In reality, though, they make a huge difference to the experience. The silver lining ensures increased privacy too, which is perfect for anyone wanting to use it as a pop up bathroom or for showering. Installation is as easy as advertized while putting it back down is simple too. The pegs will still be needed for stability, but the durable fabrics offer far greater longevity. The attachable flooring provides versatility, although the lack of a place to hang a flashlight may annoy some users. The pegs could be of a slightly better quality. It might cost a little more, but anyone seeking a more comfortable camping experience will think it’s money well spent. The WolfWise upgrade ticks all the boxes in terms of privacy, easy installation, and portability. Meanwhile, the flooring situation is particularly good for those that may use the product in a variety of locations, indoor or out. This type of product is never going to be indestructible, but the nylon fabric is less likely to rip than the cheaper alternatives. Nonetheless, it won’t withstand heavy winds without better pegs. Putting it down can be a little annoying at the first attempt, but this shouldn’t become a long-term issue. 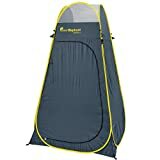 For a regular camper with access to a five-gallon water shower, this is a fantastic tent for privacy and comfort. Let’s talk about the Green Elephant and the room. 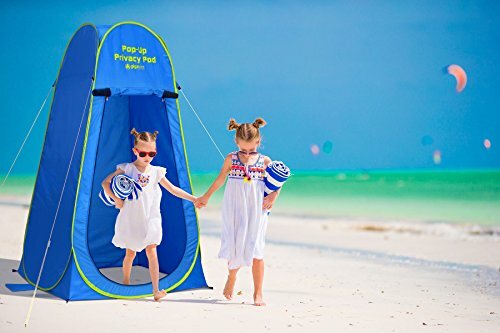 This pop up shower tent is built with many activities in mind, and can serve a purpose at the beach or on location for photo shoots. Primarily, though, it is built with showering in mind and the height makes it functional for adults as well as children. While it’s nice that the overhead facility is available, there is no means of hanging a portable shower bag. You would need to tie it to another object. For most, feeding a tube through will be a far more suitable solution. While it does take a little longer to set up, it’s hardly a major issue. Also an array of accessories such as hangers and pouches are great for some users but may not be necessary for others. A lack of flooring needs to be considered, especially for showering activities too. Depending on the ground type, you could be dirty again before you’ve even left the tent. In many ways, the Green Elephant pop up is a brilliant product. It boasts good selling points for a wider audience. Unfortunately, it almost falls into the category of being a Jack of all trades and master of none. If looking for a simple changing facility or a one-off item, there are cheaper options out there. Serious campers needing showering facilities can find solutions with greater space at head level. While this is far from being a message to avoid the Green Elephant at all costs, you can probably find something better suited to your activities. Green Elephant Pop Up Utilitent – Privacy Portable Camping, Biking, Toilet, Shower, Beach and Changing Room Extra Tall, Spacious Tent Shelter. The Pop Up Pod offers a compact design, which can seem like a positive at the start. However, this does leave limited options, even for children. A lack of space means that changing isn’t that comfortable, although there are no issues regarding privacy for the user. The walls are opaque while a lack of windows means that there are no threats of being seen. In many ways, this feels like a single-use item. Only, the price suggests that this is something to be used on several occasions. The lightweight design is a positive, but this does make the Pop Up Pod quite flimsy too. In truth, it’s best used for indoor events. For kids, this pop up changing tent is adequate. It offers great privacy which is probably the main concern of any child or parent while it certainly delivers on the portable factor. However, there are a lot of issues that are hard to ignore. It’s a fairly expensive option considering you’ll need to invest in ground sheets too. Meanwhile, the poor air circulation and easily ripped fabric aren’t particularly great for kids or for long-term usage. The fact that it is far too small for the average adult is a noticeable downside too. If you are buying an item specifically for your child’s changing at dance or sporting events, this can be an option. Otherwise, it’s probably best to look elsewhere. The Verdict – Which Is The Best Pop Up Changing Tent For You? Different users will have varying demands of their pop up changing or shower tents. However, it’s safe to assume that you’ll have one function in mind rather than several. For this reason alone, we’d probably avoid the Green Elephant when opting for a premium product. 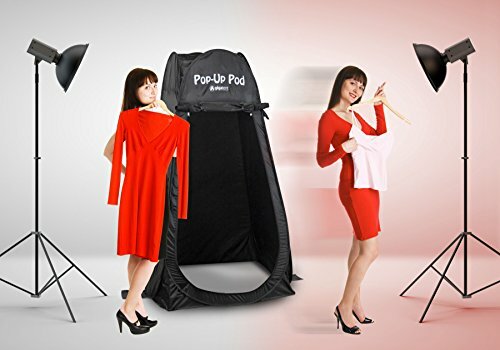 The size limitations would discourage us from buying the Pop Up Pod, unless it’s for a child’s indoor changing at events. Ultimately, the WolfWise brand is always a great starting point for your search. If you are heading off on a single camping trip, it wouldn’t make sense to waste money on a premium product. 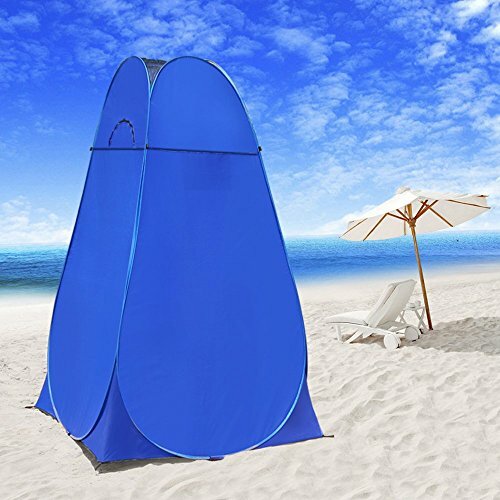 Instead, you’re probably best off with the standard pop-up shower tent. For those seeking extra comfort during their adventures, as well as frequent users, the Upgrade tent is perfect. It’s bigger, better, and suitable for many activities due to the floor sheet. Furthermore, the opaque nylon material and silver lining offer great privacy time and time again. The WolfWise Upgrade may not boast all of the accessories as the Green Elephant but from a practical sense it’s the best. If you’re a family planning on a camping trip combining the WolfWise with decent sized tent, perhaps one with multiple rooms you’ll have a complete home from home. 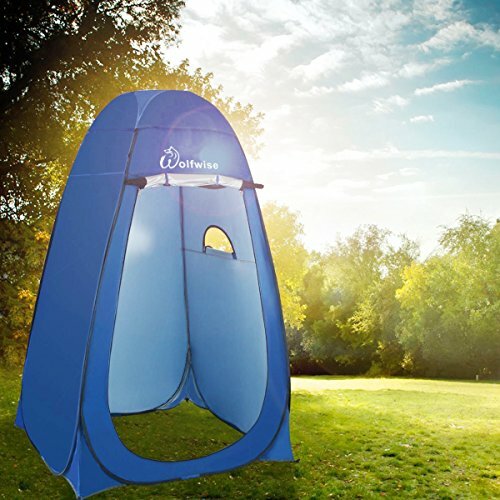 Our winner is the WolfWise Upgrade 6.25Ft Instant Pop-Up Privacy Tent With Sunscreen Fabric. Two years ago, I took a risk and left a miserable office job to follow a lifestyle career that involved my love for the great outdoors. I’ve taken my love for camping, hiking and travel to the next level by running my own small campground with a friend near Portland, Oregon. It’s for way less money but this has truly been a dream come true and the running involves lots of family and friends. The next evolution of that was to get online and start allcampingstuff.com. At our campground I spend a lot of time setting up camping equipment for customers and disposing of the garbage products they leave behind. If I can help just a few people with advice on good camping gear, then this website venture will be worth it. So, if you want to avoid the duds and spend your money wisely you’ve hopefully come to the right place. allcampingstuff.com is a participant in the Amazon Services LLC Associates Program, an affiliate advertising program designed to provide a means for sites to earn advertising fees by advertising and linking to amazon.com. Amazon and the Amazon logo are trademarks of Amazon.com, Inc, or its affiliates. Copyright © 2019 All Camping Stuff Tent & Camping Equipment Reviews. All Rights Reserved.